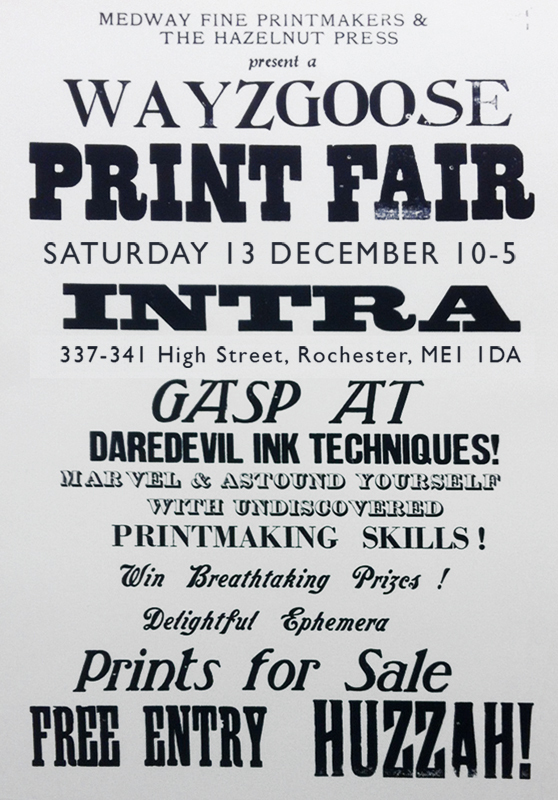 INTRA residents Medway Fine Printmakers have teamed up with another Rochester print studio Hazelnut Press to host a print fair this Saturday 13th December. ‘Wayzgoose’ is an old name for a traditional printers fair, and ours will have work on sale by over 20 artists, with prices starting from £10 for a hand printed artwork. Textiles, bags, decorations, Christmas cards and wrapping paper will be on offer too. Beyond our workshop space full of printed goodies, you’ll be able to tour the print studio, turn the handle of our fabulous Victorian etching press, and see screen printing in action. Have a go on the exciting tombola for 20p a ticket and you could bag a place on a printmaking course, win something beautiful, or end up with a tin of vegetables! We’d love to see you and show off what we’ve been making. Come and join us at the Wayzgoose! Tags: art, Christmas, events, print fair, Printmaking, wayzgoose. Bookmark the permalink. Previous post ← Halloween & Day Of The Dead – spooky half term!